By John Yeats, Esq. of Kincorth, Advocate, Aberdeen. The estate of Kincorth, on which the improvements embraced in this report have been executed, forms a part of the eastern extremity of the Grampians. It lies in the parish of Nigg, Kincardineshire, and is from two to three miles distant from the market-cross of Aberdeen. On acquiring the property in September 1842, the reporter resolved to attempt its improvement. Obstacles, by many deemed almost insuperable, abounded; but Aberdeen, where hundreds of men were unemployed, was near, and wages were low; and thus a more favourable time for the attempt was not likely to occur. The property consists of fertile haugh land, extending along the south side of the river Dee, and a steep bank of old arable land rising from it. This bank of land is succeeded by a hill, lying about 250 feet above the level of the river, both fronting the north. It also consists of an almost level valley or plain, stretching along the bottom of the hill to the west; and on the south there stands another hill, now planted, the elevation of which is some 350 feet above the level of the sea. The operations on the plain and the hill first mentioned are now reported upon. The reporter found the plain in a state of nature. It was altogether useless, producing only heath and whins, amongst which, in many parts, a blade of grass could scarcely be detected. After a fall of rain, it could be traversed neither by man nor by beast, without risk. On its surface, where not covered with large fixed stones (whinstones,) which all around met the eye, presenting the appearance of one entire mass of rock, were a few inches of loam or peaty earth; and below, a blue sandy clay, which, at a depth of from 3 to 4 feet, was found to change into sand. It contains about 44 acres, and, as need not be stated, was worth nothing while in this dreary state. In the winter of 1842, and the spring of the year following, the reporter caused the whole of it to be hand-trenched. The depth of the operation was 16 inches; the surface-sod was taken off, (not more than 6 inches deep) reversed, and laid flat, and equally divided in the bottom of the trench, while the remainder of the soil and subsoil was put upon the top of the sod, and properly levelled on the surface. Whatever stones two men with picks and levers could move, were raised; and the numerous larger masses of rock were bored, and blasted with gunpowder. The contracts for trenching averaged L.7, 7s. 6d. an acre; boring and blasting the large stones cost 3½d. a foot for inch bores, and 5d. for larger bores, exclusive of gunpowder; the average, including gunpowder, being about L.6 an acre. Stones being superabundant, it was desirable, as regarded both economy and use, to employ as many as possible in the several operations on the property; and accordingly, and at the same time to dry the ground the more effectually, the drains were made 5 feet deep and 27 inches wide, with an eye 9 inches square in the bottom, and filled above with small stones, till within 18 inches of the surface of the ground. The expense was 3½d. a yard, or L.4 an acre. Substantial stone dykes, dividing the ground into ten fields, were next erected. These are 4½ feet high, and are built in regular courses over covered drains, level with the bottom of the trench which is filled to the surface with small stones. The expense, including the cutting of the foundation and removing stones, was 10d. a yard. The fields are small, averaging 4 acres—the reporter having been desirous as well to use as many stones in the dykes as was compatible with neatness, as to divide his property into farms comprehending from 40 to 70 acres. Such, in a town locality, are found to be more advantageous than farms of greater extent. Early in the spring of 1843 these fields were ready for the plough; and, after having been for a time exposed to the action of the air and frost, and abundantly manured with Aberdeen police dung and lime, (30 cubic yards of the one, and 8½ bolls—51 bushels, of the other, being given to the acre,) they were sown with oats. 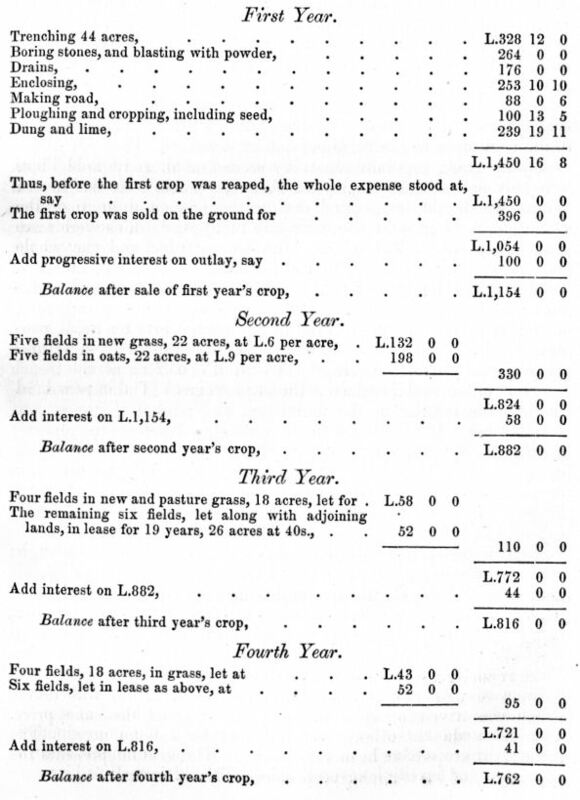 The crop was sold upon the ground, at prices averaging L.9 an acre. Five of the fields were sown with grass, and from the other five fields a second crop of oats (sown out with grass) was taken, which was also sold upon the ground for about the same price. The grass was luxuriant, and was sold for L.6 an acre. The subsequent crops have been very heavy. The ground presents the appearance of having long been successfully cultivated. It is a sandy blue clay, open soil, slightly mixed with peat moss. The reporter has incorporated this improved ground with the adjoining old land, and it is let (excluding the old land from the calculation) at rents which average fully 40s. an acre. Every field is well watered. Having proceeded with the improvement of the plain before referred to, so as to be satisfied with the results, the reporter directed his attention to the improvement of the hill, which has been described as rising about 250 feet above the level of the river Dee. It lies a little to the westward of the plain, and contains 66 acres of ground, which, like the plain, was thought by many would prove incapable of being improved for profit or use. The rocky barren worthlessness of the one describes that of the other; in all respects both were similar. And suffice it to say, that in the years 1844, 1845, 1846, the hill was operated upon as the plain had been, although at somewhat greater expense, labour having risen in value. The crops and rents have yielded the same satisfactory results. This hill was divided into eighteen fields. These are enclosed with dykes built in regular courses, and in other respects similar to the enclosures of the fields previously described. They are abundantly watered; and between every second or alternate field there is a belt or enclosure, to secure shelter, (50 feet wide within the dykes,) which will be planted during the present autumn or the next spring. For the reasons already mentioned, all the fields are small in extent. Most of them have been twice, and the whole once, cropped with oats. The soil is yellow loam, and open. To promote the proper management of his new land, and complete his arrangements, the reporter has added it to the adjoining farms; so that these farms now comprehend nearly an equal proportion of old and new land. The leases are for 19 years; and the new land yields an average yearly rent of L.2 an acre. The reporter was desirous to provide good roads, without which no improvements can be rendered really useful. And, in forming these, he contrived to get rid of many hundred cart-loads of stones, which he could not otherwise, without considerable unproductive expense, dispose of—as he had in drains, in dykes, in houses, and in making up and levelling several fields of his old as well as his new land consumed as many of his heavy antagonists as could, with advantage, be used. Accordingly his property is now intersected by roads of a solidity which the lapse of many years will not materially affect. They are founded with stones compactly laid together to a depth of from 6 to 8 inches, over which abundance of "metal" is deposited. He has erected four complete farm-steadings, which the tenants possess on dead inventory, besides altering and improving other buildings on his property. In conclusion, the reporter may humbly state his belief that the improvements which he has effected will not be without their use. To himself they will prove remunerative; and to the environs of Aberdeen, the substitution of verdure for bleakness will afford some additional beauty. The reporter's improvements were all designed and carried most satisfactorily into execution by Mr James Mennie, land-surveyor in Aberdeen.